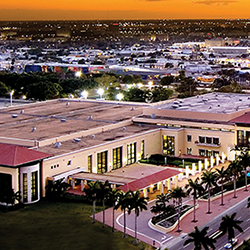 The Palm Beach County Convention Center is conveniently located in downtown West Palm Beach; just minutes from I-95, Florida’s Turnpike, and Palm Beach International Airport, the convention center is in the center of it all. The Housing deadline has passed. Please contact Maureen Bayley to request housing and be added to the wait list. Please include your arrival and departure dates. Government rated rooms are sold out. Those seeking government-rated rooms will need to contact Maureen Bayley to be added to the wait list. ACT has reserved a guest room block at the Hilton West Palm Beach at a special discounted rate of $218 per night. Attendees are responsible for booking their own hotel accommodations. Hotel room rates are subject to applicable state and local taxes (currently 13%) in effect at the time of check-out. Please note that the room rate is for single or double occupancy; there may be additional charges for more than two adults in a room. The room rate is offered three days prior to and three days following the ACT meeting, based on availability, for reservations made before the cutoff date. Please note that sleeping rooms are limited at the Hilton West Palm Beach. Room reservations will be taken until the block is sold out or the cutoff date of September 23, 2018, whichever comes first. Room reservations received after September 23, 2018, or after the block is sold out, cannot be guaranteed at the discounted rate. Check-in time is 4:00 pm, and check-out time is 11:00 am. Basic-tier wireless internet is included in the room rate. 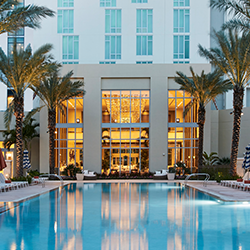 Reservations at the Hilton West Palm Beach Hotel can be made online by accessing the ACT reservation website. If you would like to make your reservation over the phone, please call 1.855.757.4985 and mention the group name “American College of Toxicology” to receive the meeting rate. The Hilton West Palm Beach offers valet parking at a daily rate of $25. 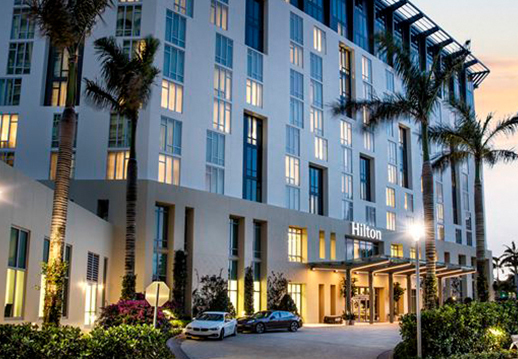 The Hilton West Palm Beach offers a complimentary airport shuttle that leaves the hotel every 30 minutes (on the :15 and :45) and leaves the airport every 30 minutes (on the :00 amd :30) between the hours of 6:00 AM – 11:00 PM. Should you need to cancel your reservation, 48-hour advance notice is required to avoid a charge of one night’s stay and tax. 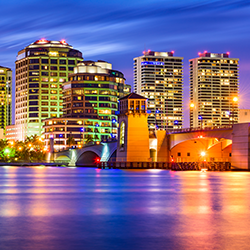 Located within a 15-minute walk of the Palm Beach County Convention Center, you can create your own true West Palm Beach experience at the West Palm Beach Marriott. 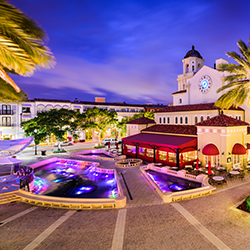 You're within easy walking distance of many popular sights, such as the Kravis Center for Performing Arts and incredible shopping at CityPlace, and within easy driving distance of the gorgeous local beaches, Atlantic University, and other attractions. ACT has reserved a guest room block at the West Palm Beach Marriott at a special discounted rate of $199 per night. Attendees are responsible for booking their own hotel accommodations. Hotel room rates are subject to applicable state and local taxes (currently 13%) in effect at the time of check-out. Please note that the room rate is for single or double occupancy; there may be additional charges for more than two adults in a room. The room rate is offered three days prior to and three days following the ACT meeting, based on availability, for reservations made before the cut-off date. Please note that sleeping rooms are limited at the West Palm Beach Marriott. Room reservations will be taken until the block is sold out or the cutoff date of September 23, 2018, whichever comes first. Room reservations received after September 23, 2018, or after the block has closed, cannot be guaranteed at the discounted rate. Check-in time is 4:00 pm, and check-out time is 11:00 am. Basic-tier wireless internet is included in the room rate. 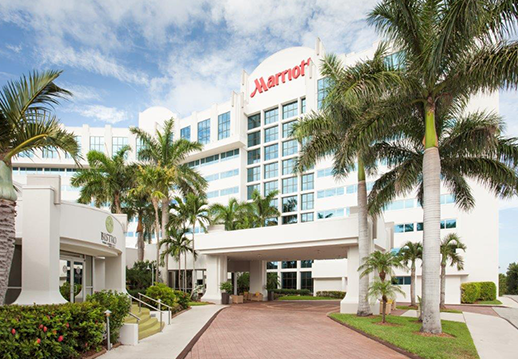 Reservations at the West Palm Beach Marriott can be made online by accessing the ACT reservation website. If you would like to make your reservation over the phone, please call 800.376.2292 and mention the group name “American College of Toxicology” to receive the meeting rate. 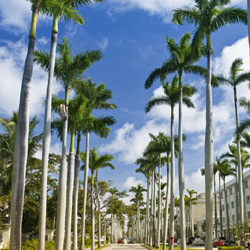 The West Palm Beach Marriott offers on-site self-parking at a rate of $14 daily. No valet parking is available. The West Palm Beach Marriott offers a complimentary airport shuttle on request Monday through Sunday starting at 6:00 am. Call the shuttle line at 561.833.1234 to request a shuttle pickup at the PBI airport. 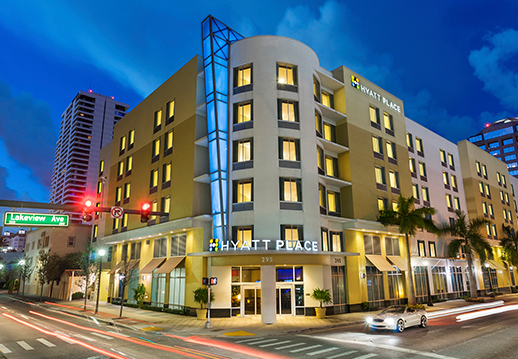 Located less than a half a mile from the Palm Beach County Convention Center, the Hyatt Place West Palm Beach Downtown combines style and innovation to create a new hotel experience for meeting the evolving needs of today’s travelers. The hotel offers free breakfast to hotel guests and a complimentary local shuttle within a two-mile radius of the hotel. ACT has reserved a guest room block at the Hyatt Place West Palm Beach Downtown at a special discounted rate of $159 per night. Attendees are responsible for booking their own hotel accommodations. Hotel room rates are subject to applicable state and local taxes (currently 13%) in effect at the time of check-out. Please note that the room rate is for single or double occupancy; there may be additional charges for more than two adults in a room. The room rate is offered three days prior to and three days following the ACT meeting, based on availability, for reservations made before the cutoff date. Please note that sleeping rooms are limited at the Hyatt Place West Palm Beach Downtown. Room reservations will be taken until the block is sold out or the cutoff date of September 23, 2018, whichever comes first. Room reservations received after September 23, 2018, or after the block is sold out, cannot be guaranteed at the discounted rate. Check-in time is 3:00 pm, and check-out time is 12:00 noon. Basic-tier wireless internet is included the room rate. Reservations at the Hyatt Place West Palm Beach Downtown can be made online by accessing the ACT reservation website. If you would like to make your reservation over the phone, please call 1.888.492.8847 and mention the group name “American College of Toxicology” to receive the meeting rate. 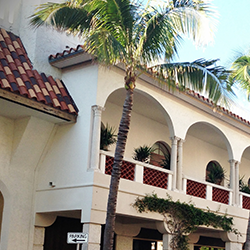 The Hyatt Place West Palm Beach Downtown offers complimentary self-parking for one vehicle. Additional vehicles are $20 per day. No valet parking is available. A deposit equal to one night’s stay is required to hold each individual’s reservation and will be applied to the first night of the reserved stay. Should you need to cancel your reservation, 48-hour advance notice is required to avoid a charge of one night’s stay and tax. ACT is pleased to provide a Room Sharing Program. This program is designed to help attendees reduce the cost of attending the Annual Meeting. The Room Sharing Program is open to all 2018 ACT Annual Meeting attendees. 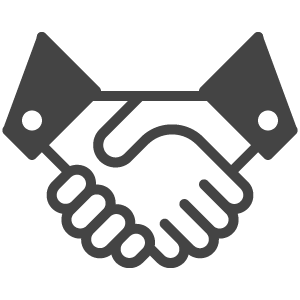 The function of the Room Sharing Program is to help participants to find a roommate. The program does NOT secure a room for you. Hotel arrangements must be made on your own early, before the room matching service close date, to ensure you secure a room with the reduced block rate. To participate in this program, please complete the Room Sharing Program Form (below) no later than August 23, 2018. The American College of Toxicology will keep a list of attendees who wish to share a room to reduce expenses. If you are interested in finding a roommate, please submit the following form to ACT (preferred) to be placed on the list. Make sure you supply us with complete information and mention that you want to be placed on the hotel room sharing list. If information is incomplete, we cannot guarantee that your name will be included. ACT will handle communication between attendees. Please note that this program does not secure a room for you. You must make your hotel reservations directly with the hotel via the links included in the housing information. If you have trouble with this form, please send an email containing the above information to ACT Headquarters. We have been made aware that unauthorized companies are contacting ACT exhibitors and registrants offering hotel reservations at West Palm Beach area hotels. These “unofficial” housing companies are aggressively pursuing exhibitors and attendees to book hotel rooms through their company at supposedly significant discounts. Unfortunately, some past attendees have fallen prey to these companies and have either been relocated with little or no warning, lost their significant deposits, not been given the type of guest rooms they thought they had booked, or not been given the hotel they thought they had booked. This has caused great hardships to these individuals. ACT does not work with an official housing company. Please be sure to make your reservation directly with the hotel. Reservations made through anyone other than the hotel or their reservation center will be at your own risk. Please note that Hilton, Marriott, and Hyatt do not solicit reservations or credit card information by phone. If another housing company trying to sell hotel rooms contacts you, please notify Maureen Bayley.